People all over the world have heard about the plight of sea turtles in the media as their populations have been dramatically reduced worldwide, earning them Critically Endangered status on the IUCN Red List. The Mamanuca Islands are one of the major nesting and foraging ground for Green and Hawksbill turtle and were once exploited for traditional use in the Mamanuca Group. The UNDP Small grant programme awareness, the significance of sea turtles, their status in the world and the legislation that protect them are shared with the identified stakeholders, the villages, schools and resorts. Through the Mamanuca Sea Turtle Conservation Project supported by the United Nations Development Programme (UNDP) and funded by the Global Environment Facility (GEF) Small Grants Programme (SGP), the Mamanuca Environment Society (MES) is working to protect the remaining turtle population in the Mamanuca and Malolo Islands. 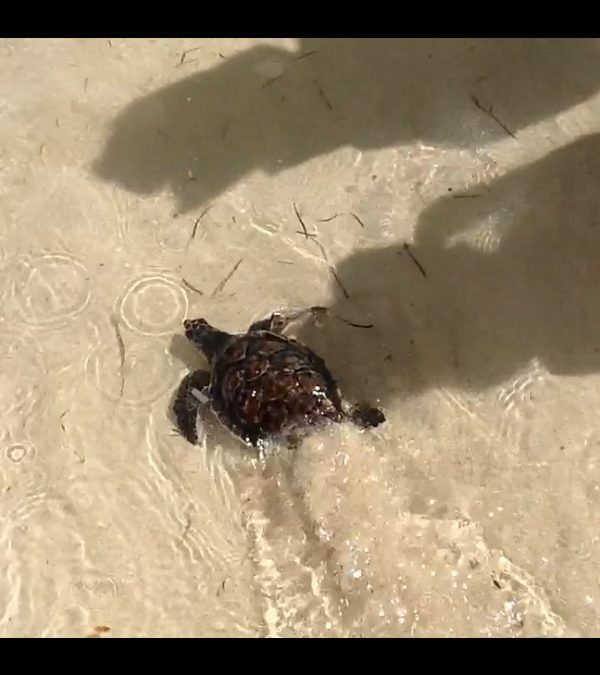 It was a fine sunny day on Friday the 26th of January 2018 as resort guests; both young and old, Mana resort staff farewelled a Hawksbill turtle that was found and taken care off at the rehabilitation pond late August of last year. Guests stood side by side in a guard of honour as a guest carried the turtle to the water edge. “I am so glad that I attended todays program not only was it informative but it also touched a lot of hearts once we released the turtle” said Mr Joe Thompson. He was found washed up in front of the beach at Mana Island in 2017. According to little Miss Audrey a house guest with her parents, she has never touched a turtle in her life and it was a day to remember. She also thanked the organizers and facilitators for the organised program. Mamanuca Environment Society Project Officer, Ilisapeci Sokidi said during her briefing that the turtle is in collaboration with the resort to create more awareness of nature. “With the existing rehabilitation of injured sea turtles on Mana Island Resort, an exemption from the local Fisheries Department was gained in favour of educational programs for visitors and locals and to breed injured turtles before tagging and releasing them back into the ocean,” said Ms Sokidi. “Since the Turtle Moratorium expiring in December 2018, the Society’s aim is to build collaborative work with the village communities and the tourist operators to continue protecting these critically endangered sea turtles by promoting sustainable best practices techniques, reducing harvesting of turtles and conservation of breeding and foraging grounds through a range of demonstration, advocacy and capacity building programme added, Ms Sokidi during her briefing. MES will continue to work with conservation partners, member resorts, schools and communities in leading the work of turtle conservation to maintain the protection of these critically endangered sea turtle population.